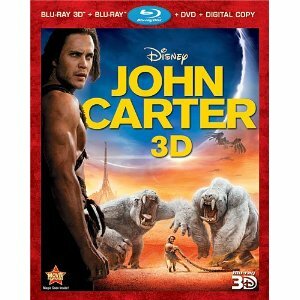 WorldMovieStore - John Carter Sinopsis. John Carter, a Civil War veteran who in 1868 was trying to live a normal life, is "asked" by the Army to join. But he refuses so he is locked up. He escapes and is pursued. Eventually they run into some Indians and there's a gunfight. Carter seeks refuge in a cave. While there he encounters someone who is holding some kind of medallion. When Carter touches it, he finds himself in a place where he can leap incredible heights, among other things. He later encounters beings he has never seen before. Later he meets a woman who helps him to discover that he is on Mars. And he learns there's some kind of unrest going on. Read More Sinopsis. 0 Response to "Blu-ray Release John Carter"